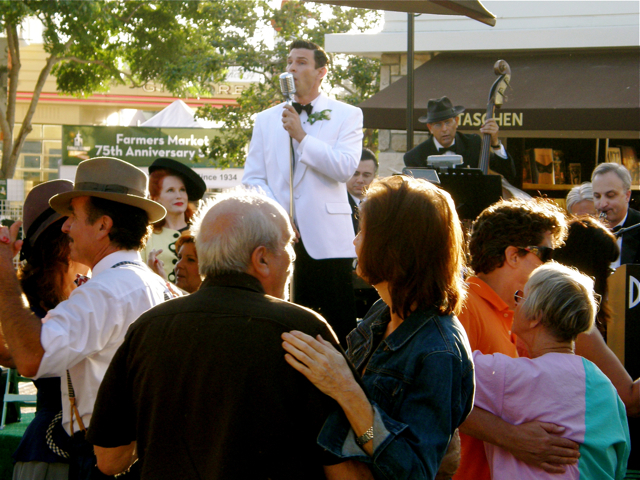 We began our culinary adventure with a trip to LA's Farmers Market at Fairfax and Third, a food-lovers' destination since 1934. 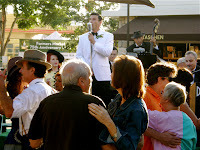 (Side note: that's me crooning pop songs of the era at the Market's 75th Anniversary with vintage swing and big band Dean Mora and his Orchestra). As this was our first Guardian Service turkey, we opted to cook it stove-top, a hallmark of Guardian Service cookware, and found that the stove-top method yields a rich and succulent turkey. While it is not "steaming" a turkey (as Joy of Cooking's Rombauer disparages it) this method employs lower temperatures, using the meat's own juices and is very similar to braising, a type of pan roasting. 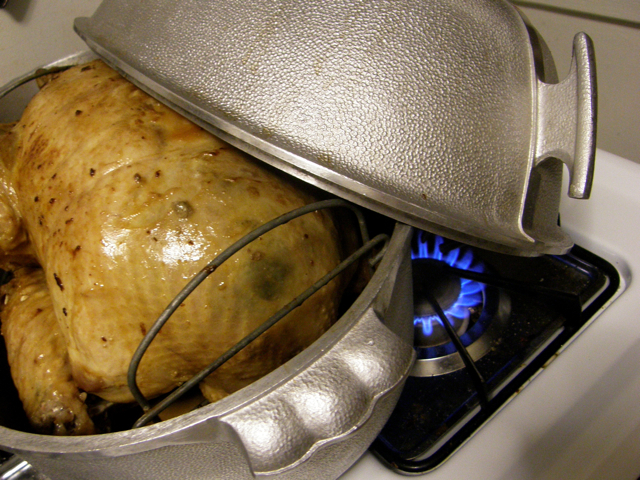 The bird can be browned at the finish using the "stove-top browning" technique to reflect burner heat back onto the food's surface. The result is a delectably juicy bird that excels in flavor, tenderness and ease of slicing. It may not have the uniformly mahogany appearance and crispy shell of the Norman Rockwell ideal, but you won't suffer the dry and flavorless meat that often results from open-roasting in an oven, nor need to brine it for hours to ward against an arid turkey. The large Guardian Service roaster is an impressive and beautiful design. 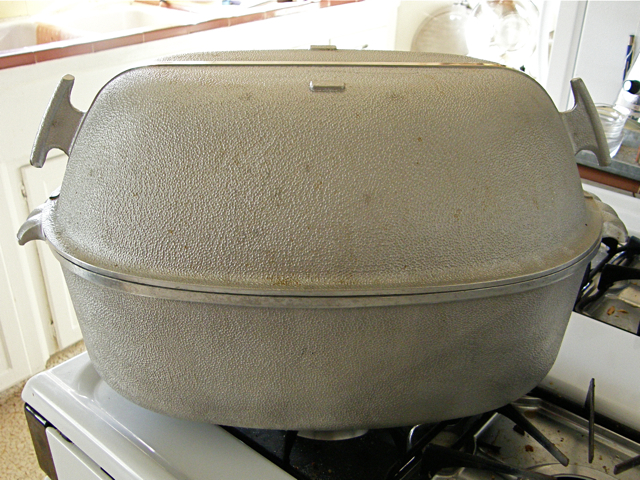 The oval pan has claw like handles which allow for a firm grip, and jutting from either side of the deeply-pitched dome lid are wing-like handles, reminiscent of Mercury's helmet. But while the roaster may be the Big Bad Boy of this cookware line, it's still modest by today's out-sized expectations—its internal dimensions are 11" wide, 16.5" long, and about 9" high, if you're cooking with the rack. Our turkey was an ideal size for the roaster—just over 13 lbs—but I don't think the roaster could handle a turkey exceeding 15 lbs. Roasting a turkey "The Guardian Way" employs a similar technique to the one we presented when roasting a chicken. It's just a bigger roaster and a bigger bird, so you may want a friend or two handy for some of the hefting and turning. 1) Prepare the turkey (bring to room temperature, remove the neck and giblets from the cavity and rinse thoroughly, pat dry and salt the bird, inside and out). Lather with butter, stuff and truss. In a medium pan (we used the 2 qt dome cooker), roast the neck and giblets over a layer of celery and garlic for an hour, then add water and continue to simmer on low until you're ready to add it to the stuffing and/or gravy (see below). 2) Over a medium burner, heat 2 Tbsp. fat and 2 Tbsp. butter in roaster and coat pan well. 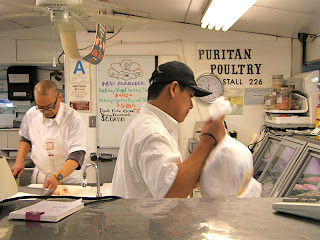 Place turkey in roaster and sear, browning all surfaces of the bird, 90 seconds per plane so that the skin caramelizes. (This keeps the juices inside the turkey as it cooks). Be bold! We used two large spatulas, rolled the bird in the pan, and grabbed it with a clean towel. Properly trussed the bird can take some handling. 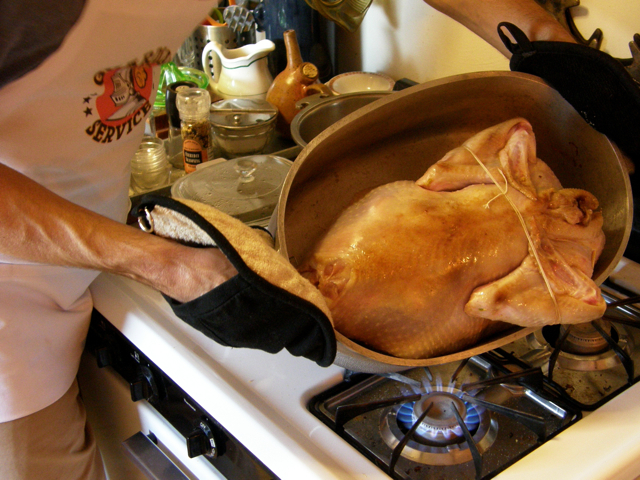 Remove turkey from pan; pouring off and reserving excess fat. Place turkey on its breast on roaster rack and lower into roaster. (Optional: we added two whole jalapeños to the roaster to scent the bird and compliment the Californio theme of our stuffing—see below). Cover with lid and cook over both burners at low heat for 15-20 min/lb. 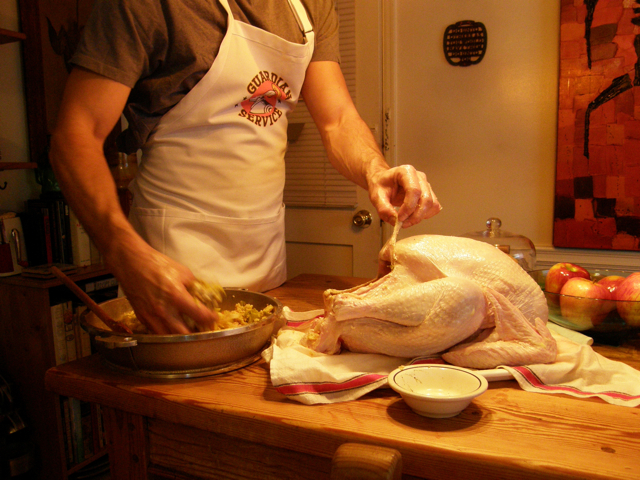 3) Halfway through the roasting period, flip the bird—that is, turn it to distribute the juices. Remove the roaster lid and invert it as a resting tray, then remove the rack from the roaster and place turkey in the lid. Turn the turkey on its back, reposition on the rack and return it to the roaster to continue cooking. 4) The turkey is done when its juices run clear, the wings give and the thigh meat reaches 165℉. Now comes the fun part, finishing by browning the turkey using the deflected heat of the Guardian Service stove-top browning technique. Set roaster to one side of stove, remove lid and position it so it channels the heat over the turkey. Now you are a knight using his shield to roast his catch over an open fire! Turn it any way you please, letting each side of the turkey get a good toasting. Meanwhile baste well to give a healthy brown glaze. 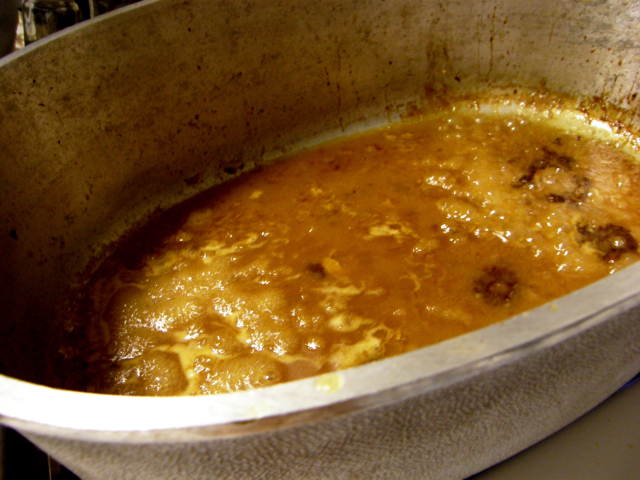 My mother's family's method for making gravy is a long-held tradition passed down through my great grandmother Ruth Lee Peterson, as Yankee a Puritan as they came. The method is simple, but requires patience and diligence, for which you'll be rewarded with unparalleled flavor. 1) Over medium heat, reduce the roaster pan drippings until they caramelize and stick. NOTE: It can take 30-40 minutes for the sugar in the drippings to properly caramelize and the fat to separate and run clear. During this window it is crucial that you ignore your nagging doubt and the hand-wringing of loved-ones who think you're burning the gravy and wondering why dinner is getting cold and why you're ruining this festive occasion... Patience—and DON'T SCRAPE the bottom of the pan. 2) When the fat separates from the browned turkey drippings, pour off all but a Tbsp or two of the excess fat and return the roaster to a low heat. NOTE: Because the Guardian Service pan heats evenly, it's harder to get drippings to really hold to the bottom of the pan*. (We used a free-range bird which has very little fat—just enough for the following step, the roux—but if you're cooking a Butterball, you may need a gravy separator for this step). 3) Whisk 2-3 Tbsp. of flour into the giblet stock and add gradually to the roaster, de–glazing the pan and blending continuously until smooth and thick. Salt and pepper to taste and serve. (Note: You can also use leftover water from boiling potatoes (or pasta) to de-glaze the pan, in which case there's no need for the extra flour—but if you're using the "waterless method" to cook your potatoes, you may not have any starchy water handy!). Optional: for a heartier gravy, use a blender to incorporate the roasted neck and giblet meat (first removing meat from the neck bones) into some of the giblet stock and add to gravy as well. *Don't fear a clean-up nightmare—the even heating of the Guardian Service cookware means an easier clean up than cheaper enamel pans which are more likely to scorch. And now, as a bonus, this year's creation: a '49er, Californio–style stuffing! Inspired by Hangtown Fry, an oyster-bacon omelet first concocted at the Cary House Hotel in Placerville, CA (then called "Hangtown" for its numerous hangings). 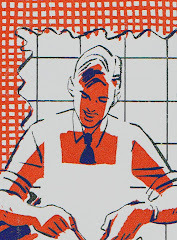 A prospector who'd just struck it rich requested the most expensive dish the hotel chef could prepare. Eggs, bacon and oysters were precious ingredients, due to their delicacy, perishability and the distance from which they were brought in the 1850s... an early example of conspicuous consumption via "Food Miles." 1) In the large GS fry pan, cook up 6-8 slices of bacon, crumble and reserve. 2) In bacon drippings, sauté the leek, celery and tomatillos. Remove and reserve. 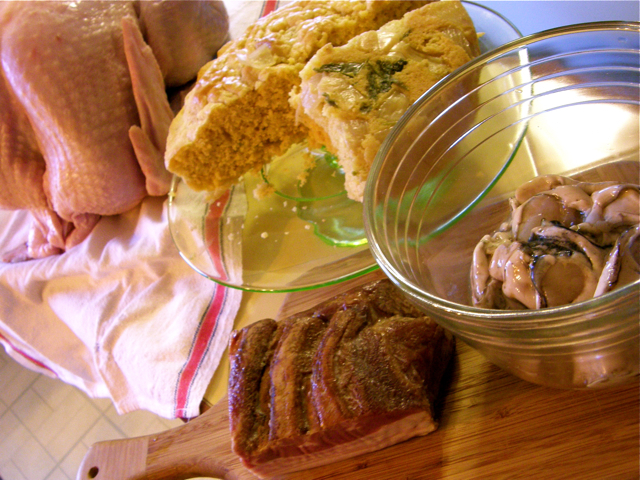 3) Dip each oyster in beaten egg, dust with cornmeal and fry in bacon fat, adding butter as necessary. 4) Mix all ingredients. Stuff turkey and top each end with half an apple before trussing. Cook excess in separate unit for about 30 minutes at 325℉. For side dishes, we served up Roasted Brussels Sprouts with Garlic (a perennial favorite from the NY Times) and another family favorite which we'll write about in our next post: the renowned Butternut Squash Bisque once served at Denver's Brown Palace Hotel. Until then, thanks for reading and from our home to yours: Happy Thanksgiving! 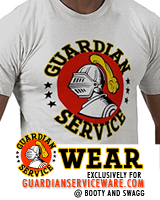 For regular readers of the Guardian Service Ware Blog, an apology for my sabbatical. I've been working a new job (yay!) which requires some driving (boo!) and I've had a little less time to both cook and write about it. I've also witnessed my eating habits change as a result. Late and large meals are ever the pitfall of my profession: you don't want to eat a lot before a show and after the curtain comes down (and a commute) you're both wired and tired and ravenous for a hot meal at 12:30 in the morning... and the fast food option rears its ugly head. To combat the temptation, I've been trying to cook foods that will feed us over several days and improve as leftovers, like beans. Beans. If the word conjures cans of syrupy mush or inedible pellets, we invite you to rediscover this nourishing, flavorful, economical and varied food, perfectly suited to Guardian Service Cookware. Back in December, 2008 we had the good fortune to attend a talk at the LA Public Library hosted by the Culinary Historians of Southern California and featuring Ken Albala, Professor of History at the University of the Pacific in Stockton, California and Steve Sando of Rancho Gordo Beans in Napa, CA. Both spoke about this humblest of staples in almost lyrical ways. We've incorporated more beans in our diet ever since. 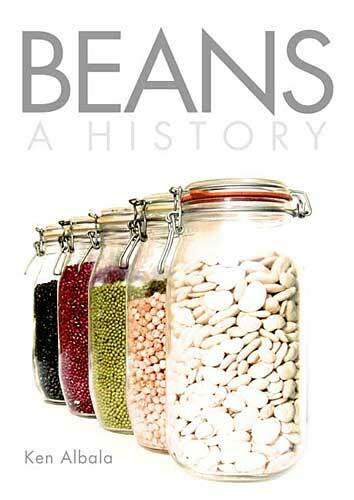 In his recent book, "Beans: A History," Albala explores the "social, ethnic and nationalistic associations" of beans as well as the "philosophical and religious reasons why people have eschewed or embraced the lowly bean." His blog chronicles his latest food adventures—check it out. Sando raises heirloom varieties of beans he has sought out in local communities throughout Mexico and Central America and their flavors and textures are as varied and nuanced as is their array of patterns and colors. He explained part of the mystery of rock hard beans, even those which have soaked overnight: your average supermarket navy beans may well have sat in a warehouse for a very long time before they reach your pot. The cooking time of dried legumes varies depending not only on their age, as mentioned above, but upon where they were grown and the kind of water in which they're cooked, which can make cooking them frustrating. Buying fresher beans from a consistent source can take away some of the guess work, but ultimately you'll need to patient and watchful. Fortunately, the consistent heat produced by the Guardian Service Cookware not only reduces the overall cooking time, but helps cook the beans uniformly. 1) In a large bowl*, soak overnight dried navy, lima, kidney or other dry beans in 3 times as much water as beans, removing any beans that float to the surface. 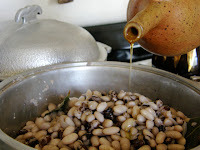 Some cooks recommend changing the bean water at least once during the soaking—it removes some of the oligosaccharides which cause flatulence. 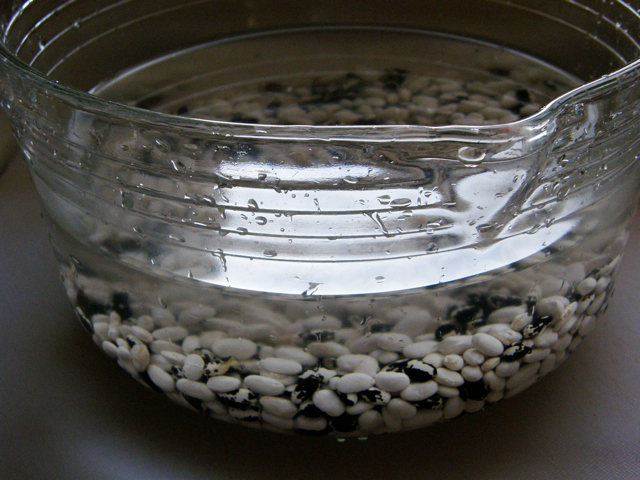 I side with Irma Rombauer and Adelle Davis who both recommend cooking dry beans in the water in which they were soaked: vitamins and minerals are also passing into the soaking water and are lost with each water change. *Don't soak beans in the Guardian Service Ware pan. While cooking with aluminum is safe, soaking for long periods can draw more metal into the food and possibly temporarily discolor your pan. 2) Transfer beans and water to Guardian Service Ware pan (the Casserole/Tureen unit works well or one of the dome cookers; if possible, select a unit with a glass lid, as it's easier to see that the beans remain on a steady simmmer). 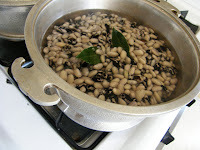 Slowly bring beans to a boil in the water in which they were soaked and maintain at a simmer over a low heat for 1 to 1 1/2 hours, stirring occasionally. Optional: Add a bay leaf or two. 3) When the beans become tender and are nearly done, add salt, pepper, fats or additional seasonings. (Don't add these before the beans are cooked or the ingredients will lose their potency and may lengthen the beans' cooking time). Remove a few with a spoon and blow on them. If the skins peel away, the beans are cooked. 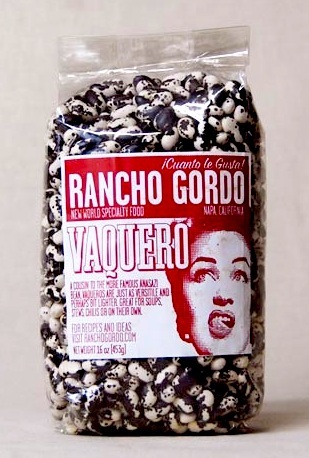 We cooked some Rancho Gordo Vaquero Beans mixed with some navy beans, then tossed them with olive oil, fresh herbs, minced shallots and sea salt. There are endless variations, though beans always pair well with tomatoes, onions, meat, cheese... "Dried peas and beans, being rather on the dull side," Rombauer writes in The Joy of Cooking, "respond readily—like a good many dull people—to the right contacts." Thanks again for checking back, loyal readers. 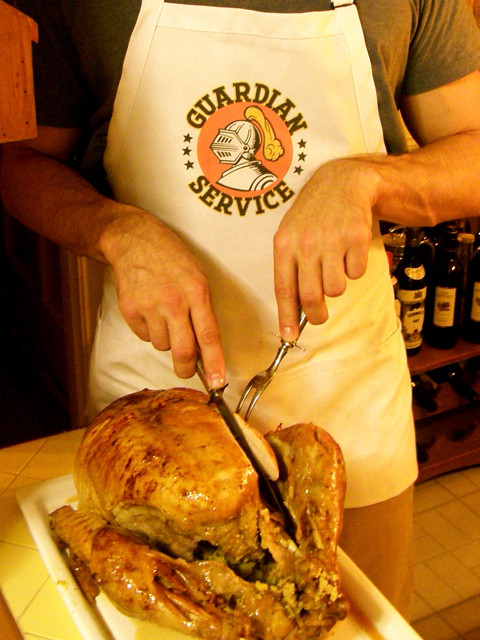 To make up for our absence, for our next blog we're planning something special: the week before Thanksgiving, we'll dig out the large size Guardian Service Roaster and roast up our first Guardian Service turkey!